My favorite kind of dinner to make for my family is a one-pan dinner. Not only are these kind of meals easy to cook, but because they only use one pan, the clean-up is fast! 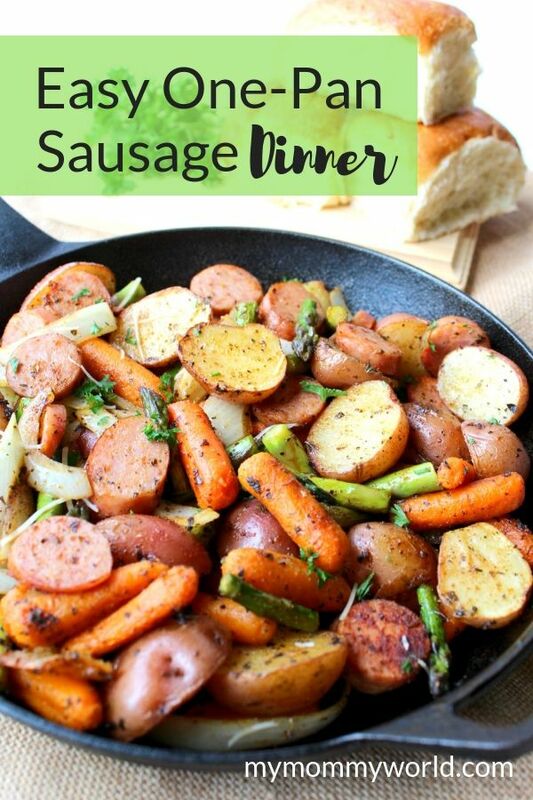 This easy one-pan sausage and veggie dinner is super simple to make, and because it is so tasty, even your pickiest eaters will love it. With big chunks of savory kielbasa, as well as tender potato, carrot and asparagus, your family will not only get a big serving of veggies, but they will come away from the table satisfied with this warm comfort food. When I first discovered one-pan meals, I was instantly hooked. Not only does everything–meat, veggies, and starch–cooking all together in one pot make for fast clean-up of dishes, but it meant that I didn’t have to time all my side dishes to finish as the same time as my main protein. With one-pan meals, you only have one pot to worry about…which is awesome when you have little ones at your feet crying because they are hungry or just want mommy to hold them. Since then, I’ve collected a bunch of skillet and sheet pan meals…and they’ve become some of our family favorites. This sausage and veggie dinner cooks on one big cookie sheet in your oven, and while you do have to cook everything in stages, it’s still easy, because you can get the first part cooking while you finish cutting up the rest of the ingredients. The ingredients for this sheet pan meal could hardly be easier. Some of the veggies are already prepped for you, or need little chopping. First, you’ll want to preheat your oven to about 400 degrees. 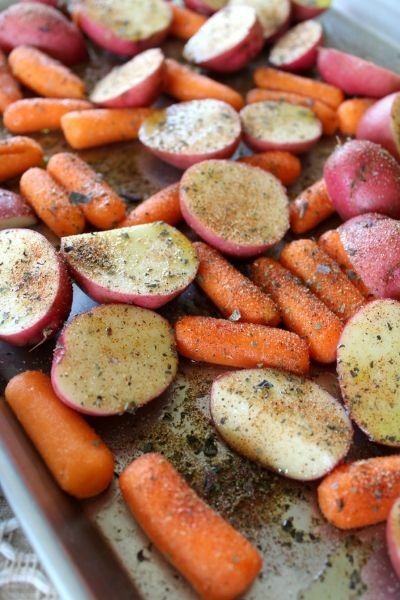 Slice the baby red potatoes in half and put them onto the sheet pan with the baby carrots. Then, in a small bowl, mix together all of the seasonings: the dried basil, thyme, oregano, paprika, onion powder, and salt + pepper (Salt and Pepper is to your taste… I used about ¼ teaspoon of each). Mix together. Drizzle 2 tablespoons olive oil and half of the seasoning mix on top of the potatoes and carrots. Gently toss to combine and place in the oven for 20 minutes. 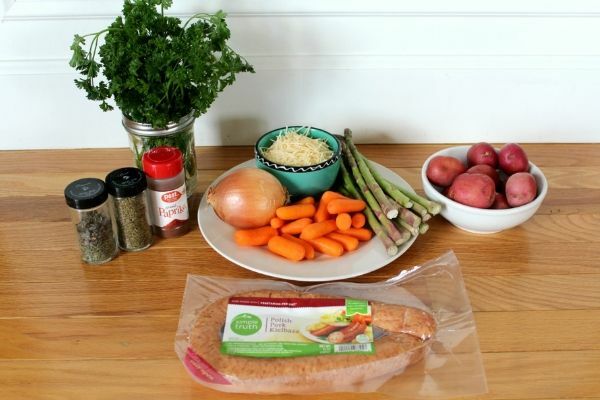 While the potatoes and carrots get a head start on cooking, you can cut up the rest of the veggies and sausage. Prepare the asparagus by trimming the ends off and then cutting the remainder into 2-inch pieces. Thinly slice the yellow onion and cut the sausage into coin shapes. Remove the potatoes and carrots from the oven and push them to one side of the pan using a spatula. On the other side add the chopped asparagus, sliced onion, sausage, and minced garlic. Drizzle the remaining 2 tablespoons olive oil over these veggies and sprinkle the remaining seasoning mix. Toss to combine and then toss those ingredients with the potatoes and carrots. Bake for another 10-15 minutes or until veggies are roasted to your preference. Top the dish with Parmesan and serve immediately. You could even prep this meal to take to a new mom or a friend who is sick, so that all they have to do is to pop it into the oven. I hope your whole family will enjoy this yummy comfort food for dinner sometime soon! Like this easy dinner? You might want to try more of these Easy Dinner Recipes for Families! This looks so yummy. I make a version of this but with different seasonings. It’s such a quick and easy meal our whole family loves. Thanks for sharing your recipe, Erin. I love a dinner like this and your recipe looks delicious! Thanks so much for sharing with us at Full Plate Thursday. Hope you have a great week and come back to see us soon! Thanks! Let me know if you try it out and how your family likes it.